Family mealtimes are important for social cohesion as well as transferring healthy eating habits from parents to children (Fulkerson et. al., 2011; Hamilton & Wilson, 2009). Young children are developing food routines and preferences that will likely continue into adolescence and adulthood. Young children are also dependent on their parents and caregivers to provide and model healthy eating (Peters et. al., 2014). Barriers to positive family mealtimes are known, but understanding how to overcome these barriers remains limited (Fulkerson et al, 2011; Moss, Ploof & Reis, 2014). This study aims to explore parents’ perceptions about healthy meals and family mealtime routines. 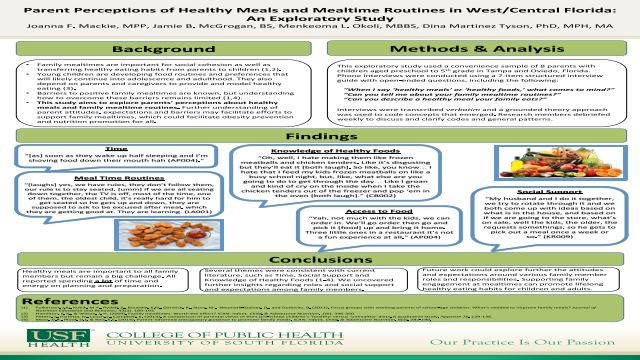 Further understanding of parent attitudes, expectations and barriers to experiencing positive family mealtimes may facilitate efforts to support family mealtimes, which may in turn facilitate obesity prevention and nutrition promotion for all..
Our sample included parents with children aged preschool to 5th grade in Tampa and Oviedo, Florida. Eight respondents were purposively selected for in-depth interviews. The phone interviews were conducted using a 7-item structured interview guide with open-ended questions, including one free-list question. Interviews were recorded and transcribed verbatim. First, ‘a priori’ themes were derived from the literature. Then, a grounded theory approach was used to code concepts that emerged from interviews. Research members debriefed weekly to discuss and clarify codes as well as general patterns emerging from the data. Themes identified from the literature were: General Nutrition Knowledge, Behavior, Social Support, and Family Structure. Codes that emerged from the interviews were: Time, Social Support, Mealtime Routines, Access to Food, and Knowledge of Healthy Food. Social Support contained the sub-codes: Family Structure, Mother's Role/Responsibility, Father's Role/Responsibility, and Children's Role/Responsibility. Mealtime Routines contained the sub-codes: Morning Meals, Evening Meals, Separate Eating, Picky Eaters, Snacks, and Child's Diet. Findings across all interviews demonstrate gaps between what participants want and what they experience. Parents have common knowledge and understand of healthy meals, but they encounter numerous similar barriers when it comes to family mealtimes. Main barriers include time, family member roles and responsibilities, and social support. Healthy meals are important to all family members but remain a big challenge. Future work could explore further the attitudes and expectations around various family member roles and responsibilities. Supporting family engagement at mealtimes can promote lifelong healthy eating habits. Summary: This qualitative study explored parents’ beliefs and practices around mealtime routines. Eight respondents were purposively selected. In-depth phone interviews were recorded and transcribed verbatim. A grounded theory approach was used to code concepts. Parents have common knowledge of healthy meals, but experience numerous barriers. Supporting family engagement at mealtimes can promote lifelong healthy eating habits.References: 1. Fulkerson, J.A., Kubik, M.Y., Rydell, S., Boutelle, K.N., Garwick, A., Story, M., Neumark-Szainer, D., and Dudovitz, B. (2011). Focus groups with working parents of school-age children: What’s needed to improve family meals? Journal of Nutrition Education and Behavior; 43(3): 189-193. 2. Hamilton, S. K., & Wilson, J. H. (2009). Family mealtimes: Worth the effort? ICAN: Infant, Child, & Adolescent Nutrition. 1(6); 346-350. 3. Peters, J., Parletta, N., Lynch, J., Campbell, K. (2014). A comparison of parental views of their pre-school children’s ‘healthy’ versus ‘unhealthy’ diets. A qualitative study. Appetite 76, 129-136.